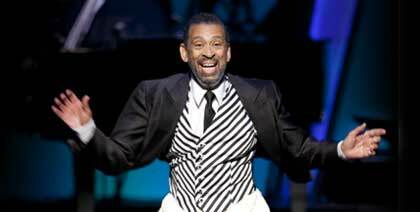 A fabulous evening of popular song, big band sound, and tap dancing – some of it wild and crazy – led by Maurice Hines, the now 70ish Broadway star and elder brother of the late tap dancing phenom Gregory Hines. What a great, old-style, evening, led by a master entertainer. The premise of this show is a review of Hines’ life, starting from childhood with his brother, Gregory, and their parents. There are a couple of projected photographs of the Hines brothers as young boys as they grew and evolved their tap dancing act, but not a lot of specific documentation or storytelling about their early lives. Hines provides a sweet cameo about his parents making up after a fight, but it is, as is much of the storytelling, episodic; in this case, it provides a lead-in to I’ve Grown Accustomed To Your Face. Additional short anecdotes are similarly used as touchstones for other vocal standards. There are numerous references to greats of the big-band jazz era, and Hines sings many of songs in that style beautifully, but the show is not really an autobiography. It is more a musical and dance variety evening with a few touches of sentimental reference to Hines’ family and upbringing. 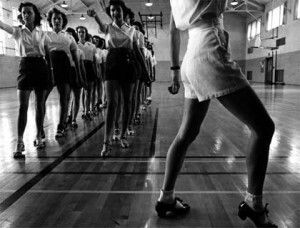 Nor is this, as the title might suggest to some, an evening of pure tap dancing. In fact, it takes Hines the better part of the evening to croon his way to the point of kicking up his heels. 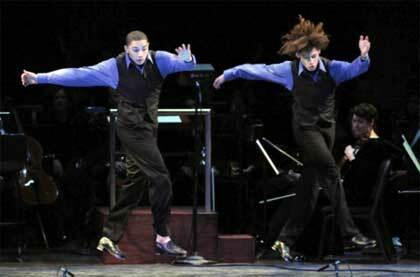 He eventually does, and, even more so, brings out some younger tap dancers who basically rip the stage apart. Granted, Hines is 70 this year and tap dancing is a lot of work. He did, near the end of the show, strut some serious stuff, but one can forgive the guy for not being able to do a whole evening of it. Instead, he brought on these three young tap dancers who were out of this world, and yielded the stage to them for a good part of the dance section of the evening, then returned for a bit of ensemble interaction with them. The implication was: I can still keep up with you guys, but not for as long as you can keep it up. Good for Hines to be able to do it at all, and good for him to nurture these young, talented dancers. Appropriately, the evening felt as much like a tribute to the scions of the art as to the past masters. Two young men who are brothers (in sweetly appropriate recollection of the Hines brothers), John and Leo Manzari, roughly twenty and seventeen, are an amazing pair, clicking their feet in patterns that defy one’s sense of possibility and challenge one’s belief that they will remain erect throughout their antics. They also add a mild touch of hip-hop rhythms and gestures to the traditional moves, giving the result a contemporary flavor. John is close cropped, but Leo has a mop of frizzy hair, making for a nice contrast. 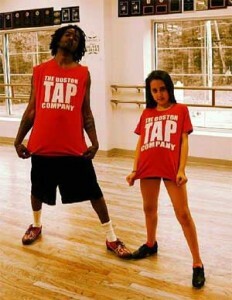 An eleven year old girl, Grace Cannady, a member of The Boston Tap Company, joined the Manzari Brothers for an amazing routine in which she sassily challenged each of them with her moves. She is so talented and capable, and exudes such confidence in her unbelievably complicated set of movements, it is hard to imagine she is only that old. Cannady’s hilarious teasing of the Manzaris led up to a great finale in which the three did their fabulous moves together. Gregory Hines died of liver cancer in 2003 at the age of 57. Hines joined the trio for a final dance routine, and then, in the coda, did his own, sleek set. It was not quite as gymnastic as the set the younger folk did, but it was damn good for a guy his age. And boy does he have style. A lot of the evening was devoted to Hines singing standards, backed up by the very excellent big band made up of Berklee College students, all rather amazing musicians. Led by faculty member and master drummer, Sherrie Maricle, the band featured solos by seven or eight of its talented members. Pianist Michael Moise provided superb accompaniment to Hines throughout; Matt Byron, on bass, offered some brilliant solos, and various of the saxophone and trombone players stood out with tastefully shaped jazz cameos. ArtsEmerson, once again, is to be heartily commended for bringing yet another stimulating entertainment to the Boston scene as part of its highly diverse and fascinating roster of offerings.